The process industry is the sector that processes mainly raw materials into new products. Oil and gas, chemicals, petrochemical, pulp and paper, and even power plants are considered process industry. 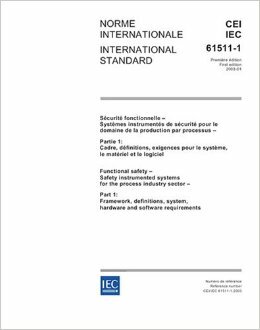 The IEC 61511 standard addresses safety instrumented systems (SIS) for the process industry. A SIS is a system composed of sensors, logics solvers and final elements. A safety instrumented system can carry out one or more safety instrumented functions (SIF). Each SIF usually protects against one hazard, for example, over-pressure. Even fire and gas systems are more and more following the rules of IEC 61511 even though they do mitigation and not prevention. This standard is for end users, engineering partners and system integrates. This standard is not for product and device developers. Any company involved in the design, manufacturing and supply of products used in safety instrumented systems is referred back to IEC 61508. That is why many IEC 61511 “people” call IEC 61508 the standard for the product developers. There are no requirements in IEC 61511 that address how products should be designed. IEC 61511 has requirements on how to identify, specify, design, integrate, install, commission, operate, maintain and repair safety instrumented systems. This process industry was heavily involved in the development of IEC 61508 but they wanted to have a standard for their industry. In 2003 they released a lean version of IEC 61508 called IEC 61511. The IEC 61511 standard follows the philosophy of IEC 61508, but is adjusted to reflect the safety systems and terminology used in the process industry. In the USA, the first standard dealing with SIL was ANSI/ISA S84.01, which was released in 1996. After the release of IEC 61511 in 2003, the Americans updated their standard by adopting the IEC 61511 standard. They released ANSI/ISA 84.00.01 in 2004 which is basically a copy of IEC 61511, with the exception that it contains a grandfathering clause. This grandfathering clause basically means that existing safety instrumented systems that where designed and constructed in accordance with codes, standards or practices prior to the issuance of this standard (e.g. ANSI/ISA 84.01-1996), then the owner/operator must determine and document that the equipment is designed, maintained, inspected, tested and operated in a safe manner. Sounds vague? That’s because it is. We recommend that any modifications to safety systems built to expired standards are implemented following the rules of the current standards. Where can I get a copy of IEC 61511? You need to visit the IEC store. Does IEC 61511 apply to product developers? No, there are no requirements in IEC 61511 on how to design safety products. IEC 61511 refers product developers back to IEC 61508. Does IEC 61511 apply system integrators? Yes, system integrators play a major role in the integration of safety products and application software. Can IEC 61511 be used to protect against economic loss? Of course. The intention with safety systems is usually protect people and environment. But the functional safety principle can easily be applied to any kind of “problem”. Wether it is financial loss, image loss, or any other kind of loss a company might endure. Does the IEC 61511 standard require certification? The theoretical answer is: No, not at all. The word certification does not even exist in the requirements of the standard. The only thing the standards requires besides that work that needs to be done is verification, validation and assessment. The practical answer is: Without certification nothing works in the functional safety world. Everything basically needs to be certified. This is driven from industry though, not from the standard. Can you certify my safety instrumented functions according to IEC 61511? Yes. We have developed the Risknowlogy Certification Program. Through this program we certify safety instrumented systems, organisations and professionals according to IEC 61511 and other functional safety standards. We can certify the design, but also whether the certified design was actually installed in the field. We are specialised in enduser and site certification. Can you certify my HIPPS? Yes, we are experts in HIPPS.